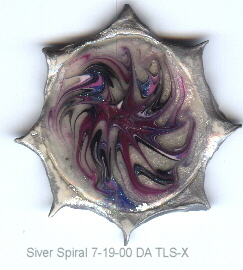 TLS is Translucent Liquid Sculpey...the liquid form of the clay. I am just learning so bear with me..but the only way to learn is to try out different things.. These aren't Great by my standards...but shows the versatility of the product. colored in with colored pencils. Cut out and layed on the cookie sheet to bake face up. Cover area in about a 1/8" thickness with TLS. Bake at 300 for 20min. This was done first on a circle of clay and baked...plain white sculpey at 275 for 28 min. cooled and sanded. 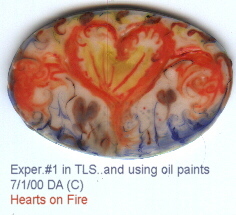 TLS applied the bits of oil paint color on a toothpic were dipped into the liquid on the clay slab and then drawn slowly making swirls and lines of color...and some i applied with a paintbrush after mixing a small amnt. of color to the TLS. Baked at 300 for 20 min. 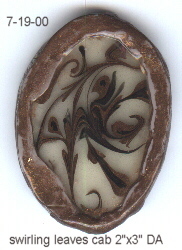 This experiment was done on an oval of clay and baked just like sealife was. 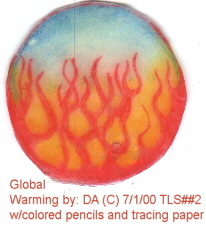 Then I did the same applying TLS to the surface just plain...then some oil colors...just tiny dots on a toothpick... Hearts on Fire! 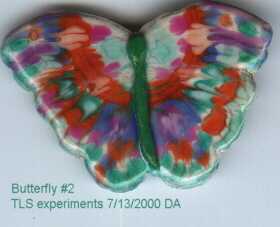 These are examples of Butterflies using the TLS over white clay. 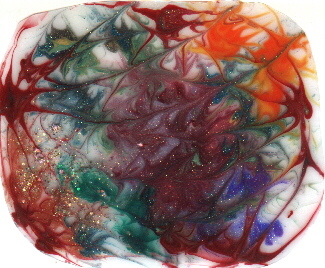 I Mixed a pallette of colors using pearlex powders and oil paints and thinned with diluent. Then you draw the pin through all the color drops and bake at 275 for 15-20 min. Glaze..viola! 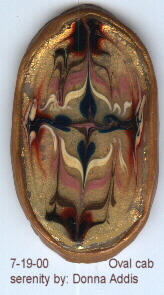 These are examples of freeform Cabochons using the TLS. 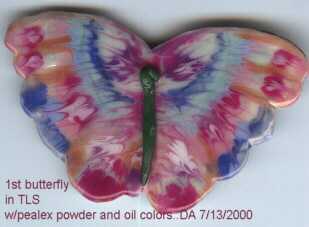 I Mixed a pallette of colors using pearlex powders and oil paints and thinned with diluent. 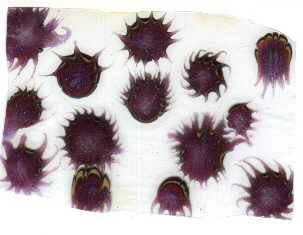 Then you draw the pin through all the color drops and bake at 300 for 20 min. Body of the cabs is gold Premo. TLS and mixes of bronze pearlex powder and ivory black oil paint..over a cab of Trans. Premo.